(Nanowerk News) The porous, sieve-like minerals known as zeolites have been used for decades in purifiers, filters and other devices. Yet creating and refining a new type of zeolite is still a matter of sophisticated trial and error: no one has been able to figure out exactly how the crystals form, even in the laboratory. Now, however, a team of chemists, engineers and mathematicians, using some of the most advanced microscopes in the research arsenal, has uncovered new details for the step-by-step evolution from molecular soup to carefully engineered zeolite crystal. With this knowledge, laboratories may be able to use targeted methods to create zeolites with precisely the crystal sizes and shapes demanded by molecule-specific applications such as chemical sensing. University of Minnesota chemical engineer Michael Tsapatsis, graduate student and lead author Tracy Davis, and their colleagues report their findings Apr. 17, 2006, online in Nature Materials. The research was supported by several National Science Foundation (NSF) grants from across three Divisions. Zeolites are familiar to consumers as, say, the white crystals in aquarium filters, or the ion-exchanging workhorses in advanced detergents. But their real economic impact is behind the scenes, where they are critical for extracting various chemical components out of petroleum and its byproducts on an industrial scale. Zeolites accomplish this feat by trapping and removing specific target chemicals, which makes it easier for companies to purify the chemicals they want. So the challenge for researchers is to tailor a zeolite for each application that traps just the right set of chemicals. Ultimately, their goal is to control the structure, size and shape of the crystals well enough for zeolites to serve as sponges for hydrogen in fuel tanks, channels in next-generation sensors and separation membranes for chemical manufacturing. "Controlling the growth of a certain crystal structure is difficult because it is done by trial-and-error, or what some critics may call a 'mix, wait and see' approach," said Tsapatsis. Researchers have lacked a clear understanding of nucleation and growth processes that control formation of those zeolites and related organic-inorganic nanostructures, he added. In an effort to improve that understanding, Tsapatisis and his colleagues have spent more than a year monitoring the growth of zeolites in a laboratory setting, where they could watch the crystal growth process in exquisite detail. 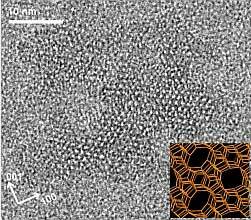 Using advanced tools that included a state-of-the-art High-Resolution Transmission Electron Microscope purchased with NSF support, and a Small Angle X-Ray Scattering System on loan from Anton Paar GmbH of Granz, Austria, the researchers were able to observe changes on the scale of single nanometers (billionths of a meter). "These are complex structures containing hundreds of atoms per unit cell and their formation is determined largely by kinetics," said Tsapatsis. "Our approach is to slow down the kinetics and exhaustively study the evolution by all techniques available to us." Ultimately, the researchers hope to develop, validate and improve quantitative mathematical models that describe the complex systems. The study showed that the zeolites form in a step-by-step, "hierarchical" fashion, with silicon-oxygen nanoparticles forming first. Those particles then aggregate into larger, more complex structures, incorporating other atoms and molecules while still leaving substantial pores and tunnels. Based on their findings, the researchers developed a set of mathematical equations that describe the nucleation and growth process. "There are essentially unlimited opportunities for these crystals if we can control their pore structure and crystal shape, tailoring designs to specific applications ranging from catalysts to bio-implants," he added. While laboratory zeolites tend to exist as microcrystal powders, the researchers hope the new insight may help yield larger structures--even layers and thin films--that are perfect for optoelectronics, sensors, and micro-reactors. "We are already attempting to prepare thin films of the materials to replace energy inefficient separations, like distillation, with membrane separations," said Tsapatsis. For example, instead of purifying products by heating the starter liquid to a boil and distilling the desired chemicals, the new membrane sieves could achieve the same goal when the fluid simply passes through. "Membranes made by our current process will cost over $1,000 per square meter - too expensive for widespread use in applications like hydrogen purification and hydrocarbon separations that need thousands of square meters of membrane," said Tsapatsis. "With the mechanistic knowledge we now have we are designing one-step film formation processes that could cost one tenth that amount." Funding for this work was provided by the NSF Directorate for Engineering Division for Chemical and Transport Systems and the Directorate for Mathematical and Physical Sciences Division for Materials Research and Division for Mathematical Sciences under the following grants: CTS-0103010, CTS-0522518, DMR-0320641, DMR-0212302, DMS-0413864 and support through the NSF National Nanotechnology Infrastructure Network.